You may wish to read an introduction to this section or two pages on Roman Pola first. 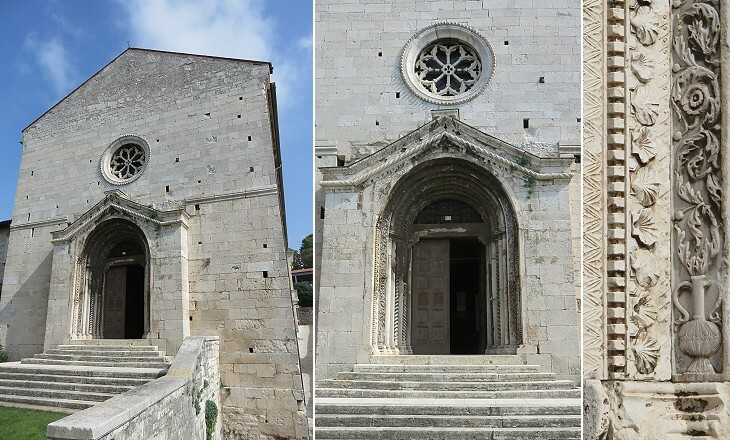 The Duomo of Pola, according to the inscription on a stone which was once no doubt the tympanum of a door, and is now fixed in the north aisle wall, was built by Bishop Handegis in 857 (..). 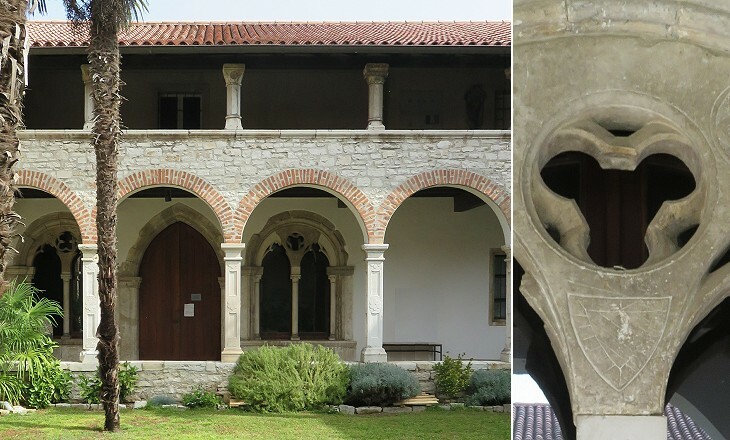 Although, however, the original ground-plan may have been more or less well preserved, and the original columns and some of the capitals used again in later work, there is little else left of the building of Bishop Handegis. The inscription is now assumed to be the gravestone of Bishop Handegis and having no reference to the construction of the church. It mentions the suzerainty of Emperor Louis II of Italy, great-granchild of Charlemagne, over Pola. 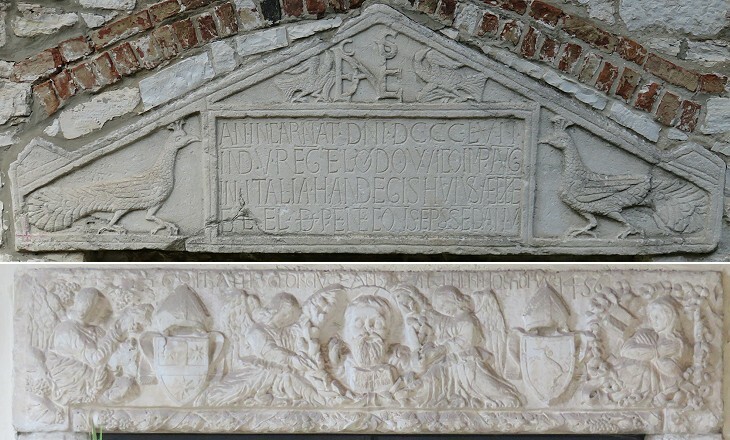 In 1000 however, the inhabitants of the town had to ask the Republic of Venice to protect them against raids by the Slavs and by the Narentine pirates (the latter had their bases at the mouth of the River Neretva in southern Dalmatia). This event marked the beginning of a bond which lasted until 1797. Pola became a bishopric see in the VIth century. 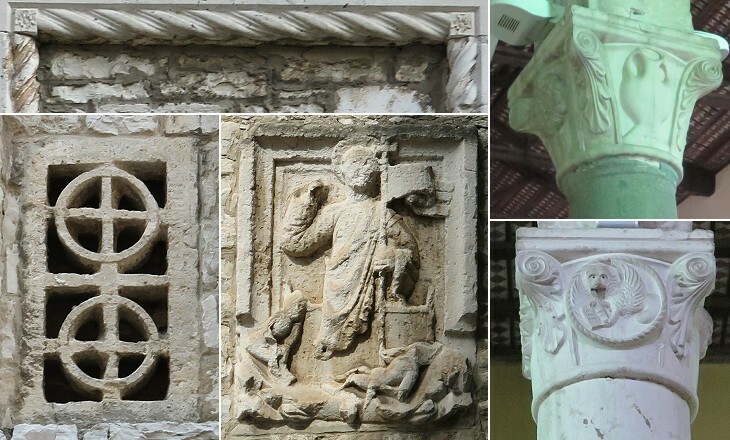 It initially reported to the Archbishops of Ravenna and later on to the Patriarchs of Aquileia. The exterior of the Cathedral and the bell tower are the result of a redesign which began in 1707 and was completed in the following century. 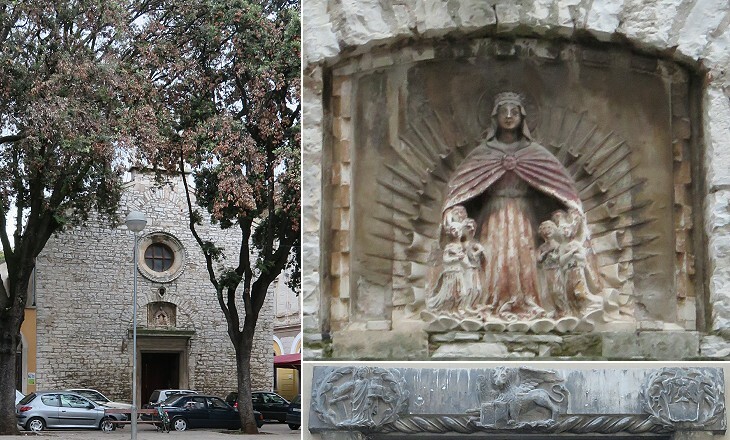 A baptistery rose in front of the façade of the cathedral. It was pulled down in ca 1850. The protection of Venice was not without a cost. The citizens of Pola had to accept limits on their trading and when they tried not to comply with these restrictions Venice did not hesitate to occupy the town. In addition Pola became a target for the enemies of Venice. In 1379 the Genoese, during the War of Chioggia, defeated the Venetian fleet off the harbour of Pola and sacked and burnt the town. The bronze gates of the Cathedral were carried off to Genoa. Similar to nearby Parenzo, Pola experienced a decrease of its population because of pestilences, in particular that of 1527. In addition malaria spread along its coastline and in summer almost all the inhabitants moved inland to avoid its effects. 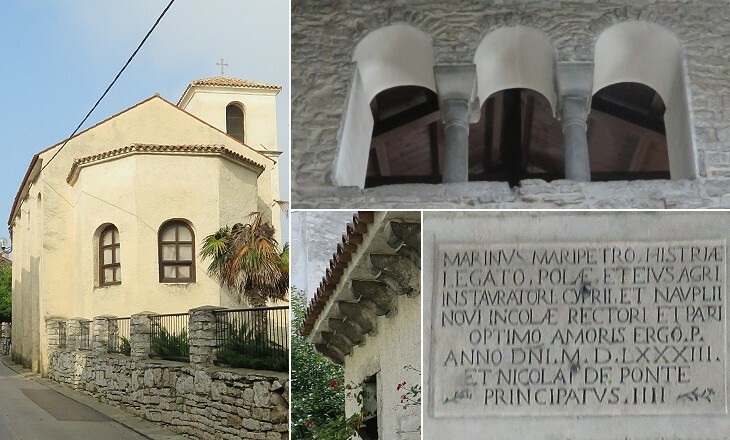 In 1583 the Venetian government assigned S. Caterina, a VIth century church, to Greek Orthodox refugees from Cyprus and Nauplia who dedicated it to St. Nicholas. Today it is the church of the Serbian community. Notwithstanding Venetian efforts to repopulate the town, Pola had just 300 inhabitants after the pestilence of 1630-31, the last of a long series. 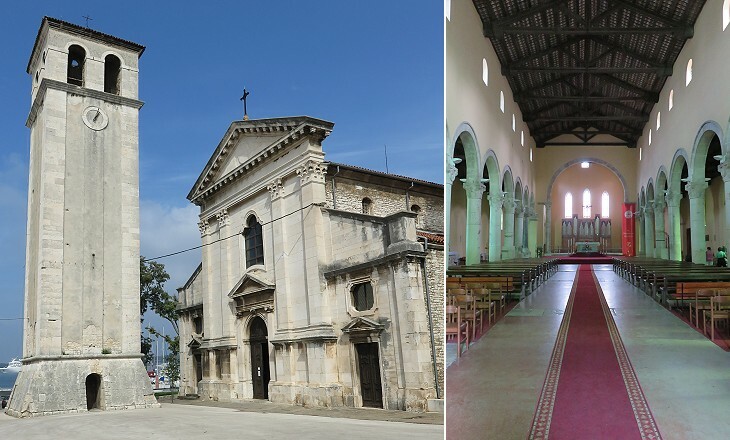 In 1927 S. Francesco returned to be a church, but the years during which it was used as a warehouse have left a mark on its very bare interior. 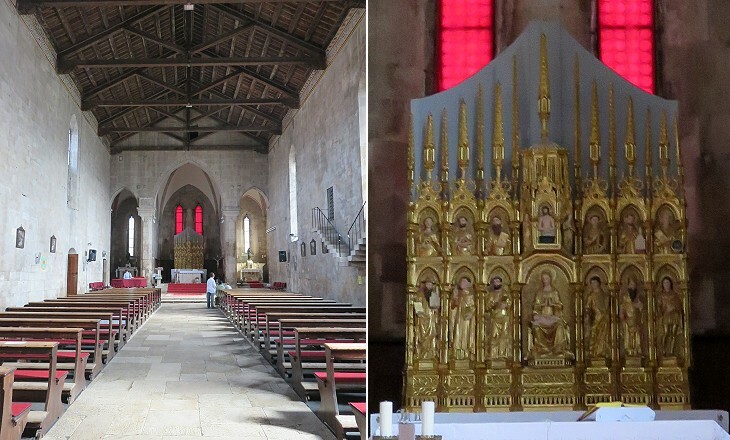 The fine polyptych is original because it had been moved to the Cathedral in 1808 when S. Francesco was deconsecrated by the French. During repairs made after WWII an ancient mosaic was found, so that it appears the church stands on a previous building. 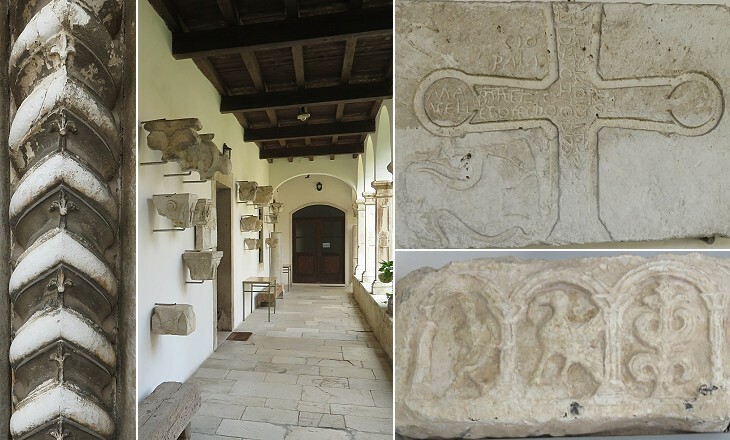 Today the premises of S. Francesco are used as a small museum: a garden near the entrance houses some Venetian inscriptions and sarcophagi (the image used as background for this page shows a relief on a sarcophagus), a series of medieval reliefs are displayed in the cloister and Roman funerary inscriptions and capitals can be seen in another garden (or rather a parking lot).